Recently, I returned to the Motherland. This trip did not take me far across land and sea, just a few hours from my Nebraska home to several very small and very Catholic towns in western Iowa to visit family over the 4th of July. Although this trip seemed familiar, it was also wrought with interesting changes from my previous visits. These changes ranged from my newfound status as a semi-adult at family events to my refusal of burgers and hotdogs as a vegetarian. 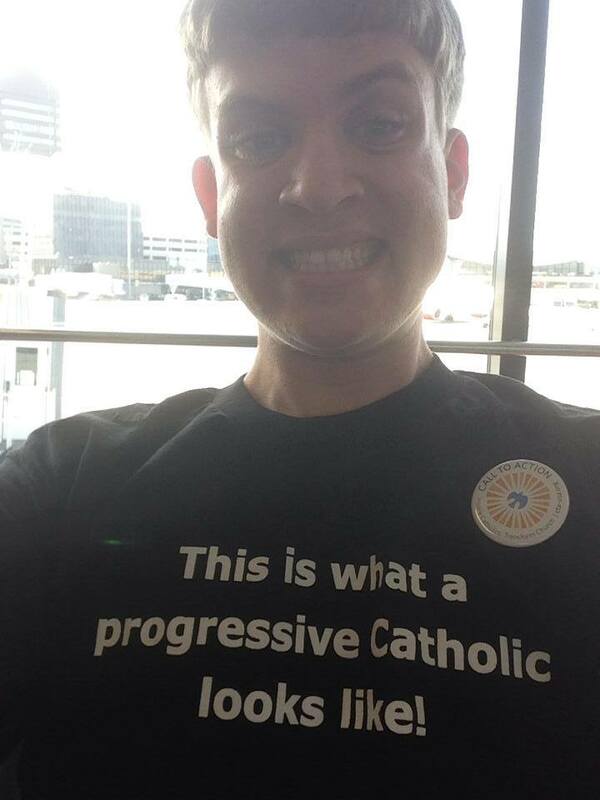 However, the most interesting change I experienced was my return to my “big-C Catholic” heritage as a self-professed “little-c” progressive catholic who isn’t the biggest fan of institutional Church systems and doctrine. For the first time, I approached the rituals and goings-on of institutional Catholicism as a semi-outsider. After nearly 5 months worshipping in an intentional community, I returned to a big-C Catholic big-M Mass. Armed with the tools of critical analysis, I half-expected to storm in and deconstruct every abusive, heteronormative, patriarchal, gender-binary-enforcing Euro- and white-centric aspect of the institutional church. And it’s true that I found those things. I found them in oppressive dogma and doctrine being spread about contraception and the LGBTQ community. I found them in the exclusively white icons of Christ and the saints, nearly crushed under golden crowns that wobbled on their heads, awkwardly large and out of place. I found them in a disappointingly familiar sexual abuse scandal rearing its ugly head in yet another diocese. I found them in my own discomfort with gendered language being used for God in everyday speech and in prayers uttered by yet another white cisgendered man from the altar. Yet, just as prepared to verbally smash each and every one of these broken parts of a broken institution, I saw something else. I saw hope. I saw hope in the priest who extended a healing hand to survivors of sexual abuse in his own diocese, and spoke out against flawed leadership. I saw hope in a small church in Westphalia, Iowa, where I read the prayer of a priest who fought for small farmers. I saw hope on my computer screen, in videos of advocates for racial and economic justice like Thea Bowman, M. Shawn Copeland, Sister Simone Campbell, Father Roy Bourgeoios and Father Michael Pfleger, as well as many of my dear friends and favorite organizations, who fought and continue to fight against the insidious sins of transphobia, racism, sexism, heterosexism, and classism so deeply settled in our Church. I saw hope in my own family, who surprised me when they agreed, and who listened, loved and accepted when they did not. I saw hope in the People of God of all genders, races, sexual orientations, abilities, religious (non)beliefs and ages who join in community in all kinds of spaces. Just last week, I found more hope than I thought possible at the CTA 20/30 Faith-Sharing Retreat, where I learned to build inclusive community with other young adult progressive Catholics. My love for the good still remaining in the people of the Church and the Spirit that moves them does not mean that I do not see the problems. In its collaboration with political institutions, military empires and deadly social structures, the hierarchy and many Church doctrines remain troublingly oppressive. I do not blame those who walk away, as many have been hurt by these structures. However, one of my religion professors once stressed that if you’re in an oppressive church system, you have two options: Leave, or stay and (figuratively) raise hell for just causes. I have chosen the latter, and I have done so out of a love for my Church, its people and what I believe we can become. I find that I’m never quite sure what I will find when I go back to Catholic services, which I do probably once every few months, mainly to make family happy. Sometimes, I feel horribly constrained, judged, and, well, angry. Other times I feel the comfort of deep familiarity. Sometimes, like you, I am pleasantly surprised. For so long I was one who raised hell from within, and then I got a little addicted to the feeling of NOT having to be ambivalent every single time I went to a church service. As time passes, I feel more and more like an outsider looking in — but then, as a bisexual woman I was that when I attended Catholic services every week, too. I continue to pray for and draw hope from those who remain and fight.